Continued from: "Age with Grace"
What Coleridge wrote for the ocean-bound sailor seems to have come true for today’s Indian. Today’s episode of ‘Satyameva Jayate’ brilliantly highlighted our callous attitude towards impending water crisis in our country. In fact, India can be cited as a perfect example of bad water management. While foreign lands have pristine pure rivers flowing and flourishing, we have reduced our rivers to sewage lines and toxic dumps. Ironically enough, we have both floods and droughts running through the country. There’s water overflow, sewage overflow in most of Indian cities during rainy season. The very same cities have acute water shortage in summer. There’re several parts of the country where news of floods is a matter of routine year after year. The same is true for drought ridden places. 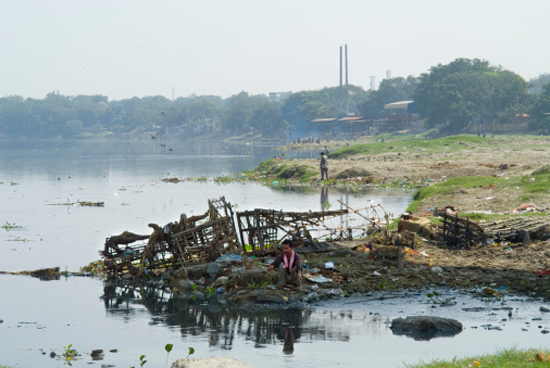 Polluted Yamuna River, Kudsia Ghat, Delhi, India. The question is not just the quantity of water; it is that of quality as well. What we have in our rivers flowing today is devoid of all oxygen. Again, ironically enough, water itself is without life. We have polluted our water resources to such an extent that the water of Yamuna in Delhi or Ganga in Kanpur comes under the category ‘dangerous’. The show began with facts. Only about one percent of water of our blue planet is drinkable or usable. Water is indeed a precious commodity. India is ‘water adequate’. Nature gives us enough water every year. Still, water is sold and bought all over the country freely. It’ll be like a dreary dream when all our canals, dams would get dry. People living in posh areas of Delhi like Vasant Vihar, want to go somewhere else where there is water. In one village of Maharashtra, Usmannagar, water tankers have been coming for the last fifteen to twenty years. In India we have developed a new ‘tanker culture’. Lives have been lost in these water wars. In a country where quenching thirst has been the culture of the soil, we wish that our guests may not ask for water. The farmers of Bihar have taken up arms to prevent water stealing. Anupam Mishra, with years of experience of social service, gave golden insight into the matter. In our desire to move forward, we’ve forgotten to look backwards. India had its adorable water harvesting means in not so olden times. It’s just two or three generations that have destroyed the traditional Indian resources of water harvesting. Every city had ponds. We all remember photos of Mohanjodaro-Harappan civilization in our school text books which had very systematic covered sewage lines and ponds system. This was our condition way back 5000 BC. Now every city has concrete structures mocking the traditional, nature friendly life style at places where earlier we had ponds. All the spots that were used for natural water harvesting have malls, residential complexes, schools and offices. Delhi used to have eight hundred ponds; today there isn’t any. Mysore used to have forty thousand ponds. It’s a tragic tale of our systematic divorce from water. The metros get water by pipes spread over hundreds of miles. Rural water is fed to urban India. The rural India is left to die. Manoj Mishra, another water crusader, said that we have very tough laws to prevent sewage and industrial flow into rivers but those laws are not implemented. Truly enough, we need to respect water. Ravi Agrawal, an expert on Toxicology told the viewers about the side effects of poisonous water that many Indians are forced to consume. Then came the time of the show when ‘water saviours ‘ were recognized; sun-shine stories were publicized. Mr Hanumant Kendre, the Sarpanch of Nagarwadi, Maharashtra, Mr. Gujjar from Alwar, Rajasthan, Mr. Navin Chandra from Mumbai, Mrs. Shanta Sheela Nair, an IAS officer from Tamil Nadu and many other water-lovers shared their positive efforts. Mrs. Nair actually made water harvesting compulsory in Chennai. She made a significant point that she could do what she wanted to do because of the political will. And that’s very true. Our politicians must be sensitized on this very crucial issue. Mr. Navin Chandra has done remarkable work in urban rain water harvesting. Quantity and quality of water in India has to be managed in a big way. People depend on governments for this. Politicians can make a big mark at the local level for this universally acclaimed task. People at large, however, should not leave things to governments only. Large issues like toxic and chemical waste recycling is not in the hand of the individual. But personal rain water harvesting, good and hygienic behaviour at holy places and at all other places also, generating awareness, respecting water – these things are very much in the hands of the individual. Aamir rightly said that it’s a slow ticking bomb but it won’t spare anyone if not taken care of. The show ended with a melodious song. It was a good show. Continued to "O God, Let My Country Awake!" how u can alone think like dis????? Great flow of thought and words in the article!